Cold, rainy and even snowy. That pretty much sums up the West Coast weekend (including Hawaii! ), and is also a fairly accurate forecast for the coming week. 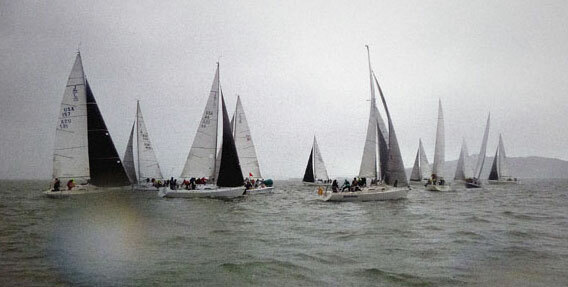 J/105 start in the second race of the day of the Sausalito YC/RegattaPRO Winter One Design Series. Sunny and always-temperate San Diego has not been immune to the round of chilly winter weather engulfing the West Side. 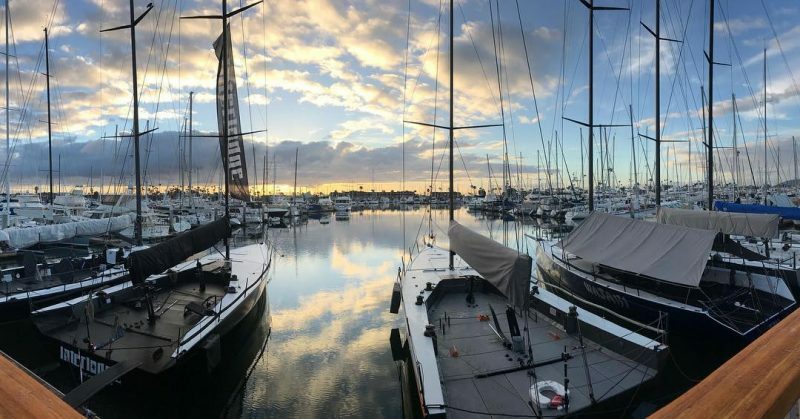 Cold conditions and light winds were on tap for Pac52s, TP52s and Beneteau 36.7s, which “kicked off their seasons with the 2019 SCYA Midwinters hosted by San Diego Yacht Club,” according to a SDYC press release. Pretty boats and pretty skies in San Diego. Meanwhile, back in the Bay Area, we had snow. A shot from Mt. 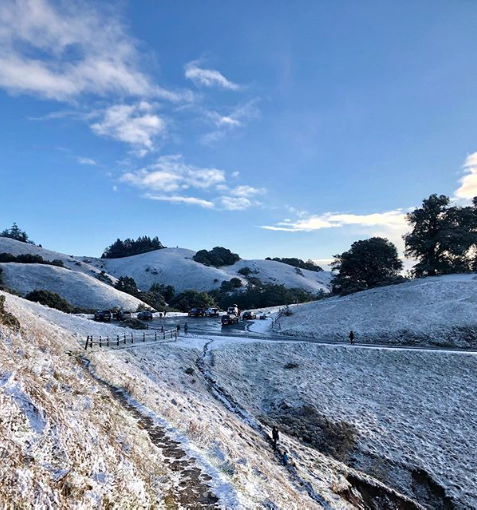 Tamalpais yesterday morning by Latitude reader Cameron Tuttle. 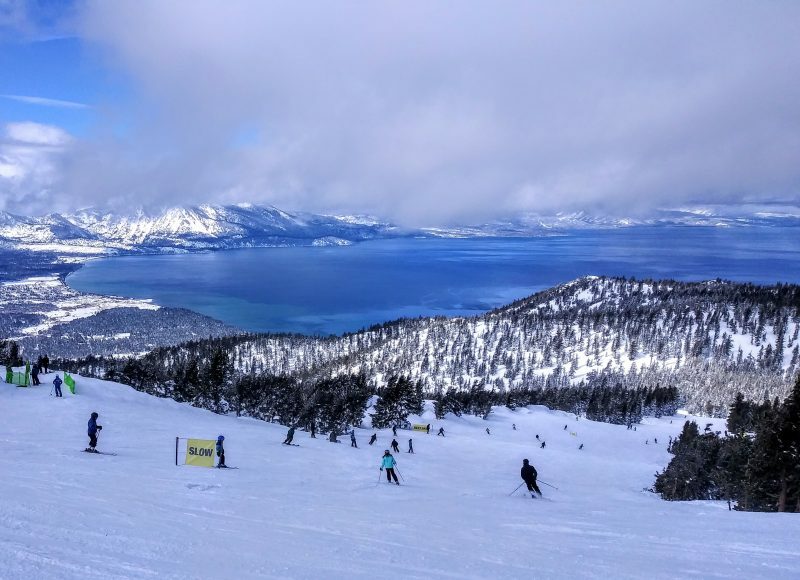 Lake Tahoe, as seen from near the top of Heavenly. (We were, ahem, doing . . . research from there on Friday.) You can’t see in this picture, but there are actually two sailboats moored near shore in South Lake Tahoe. We would love to know the story behind that . . . and to catch a ride this winter. Well, the weather for this week isn’t looking as crappy as we’d originally thought. Late Tuesday will see rapidly increasing gloominess, followed Wednesday by damp dreariness. Thursday sees a reprieve and possible sun-related warmth and happiness, followed by a soul-crushing return to rain on Friday. But seriously, we’re having an awesome winter, and hope you are, too Latitude Nation. Please let us know how your weekend was, and don’t forget to send us the pictures! The winter wrath was not limited to the mainland. 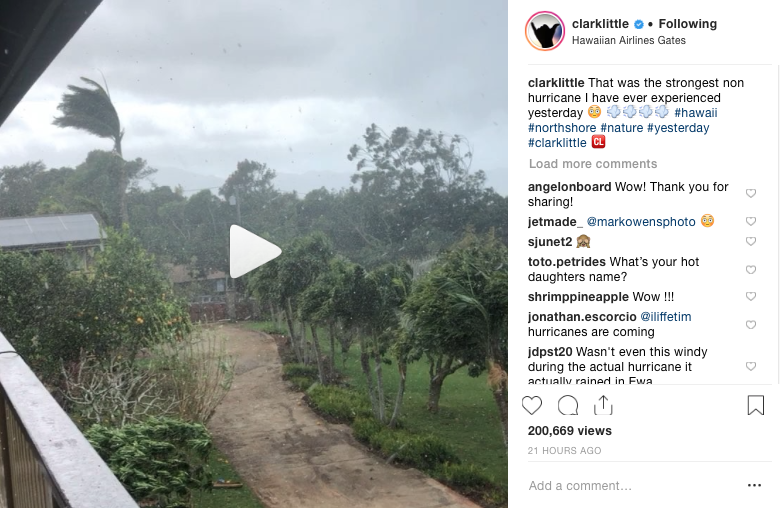 A large storm slammed into the Hawaiian Islands on Sunday, bringing massive, windblown waves and near-hurricane force winds. “That was the strongest non-hurricane I have ever experienced,” said Oahu-based photographer Clark Little. “On Sunday, wind speeds were recorded at 25- to 40-miles-per hour and there were reports of wind speeds above 50 and 60 mph,” CNN reported. And for the cherry on top . 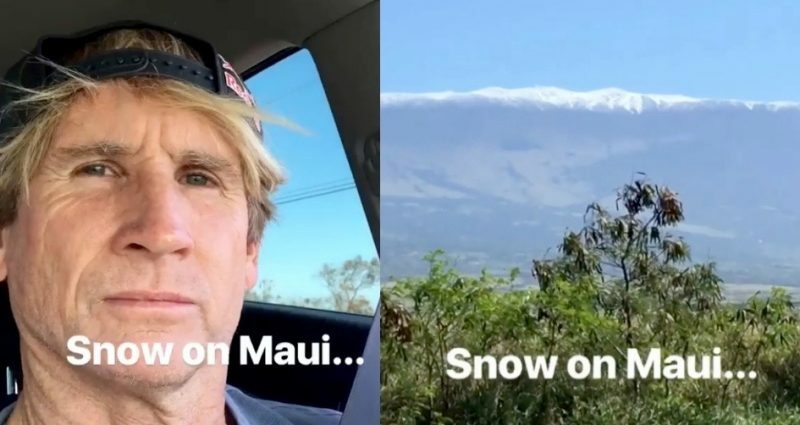 . . there was snow on Maui. “Now there’s something you don’t see everyday,” Windsurfing legend Robby Naish said on his Instagram. What’s on your sailing bucket list? If Gallup took those sorts of polls, we’d expect to see high numbers for America’s Cup skipper, round the world racer, Olympic sailing and world championships in various classes. But what about a guy who has achieved all of those things — and more? Is there anything left that could possibly be on Paul Cayard’s sailing bucket list? Born and raised in the Bay Area, Paul Cayard remains one of the top racing sailors in the world. Turns out the answer is yes, and in January he got to check it off the list when he voyaged to Antarctica. 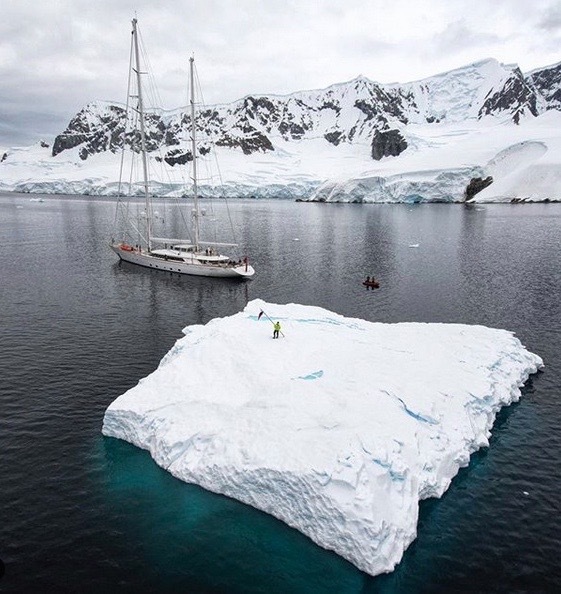 The two-week trip was as a guest of friend Joey Kaempfer aboard his magnificent 180-ft Perini Navi ketch Rosehearty. Yes, it was a bit less ‘roughing it’ than the last time Cayard sailed to 63S as skipper of the 70-ft Pirates of the Caribbean in the 2006 Volvo Ocean Race (and the 60-ft EF Language in an early version of the same race in 1998). But the ‘Rosehearties‘ sailed more than 200 miles farther south than those events — in fact, all the way to the Antarctic Circle (66.5S) and back, exploring several of the islands and archipelagos at the bottom of the world before returning to Ushuaia, Argentina. Rosehearty pauses in her Antarctic cruise while Cayard plants the ‘St. Francis YC South’ flag in the ice. And how does one celebrate an Antarctic Circle crossing? “With Shackleton’s Whiskey and cigars, outside, on the upper deck,” says Cayard. Look for Paul’s full report on the adventure in next month’s Changes In Latitudes. We know that this photo was taken by a reader at last year’s Jazz Cup, but we have, unfortunately, lost the reader’s name. If this is your photo, mystery Latitude-ian, please write us here. For everyone else, caption on(!). Please comment below, or write us at editorial@latitude38.com. We’ve always been tremendous fans of Carisa Harris-Adamson. 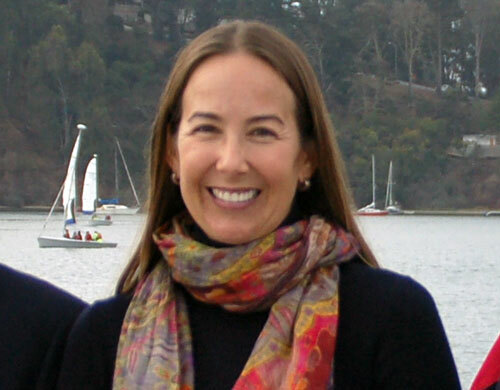 She’s worked tirelessly to expand sailing opportunities for Bay Area youth through the creation and development of the Treasure Island Sailing Center. 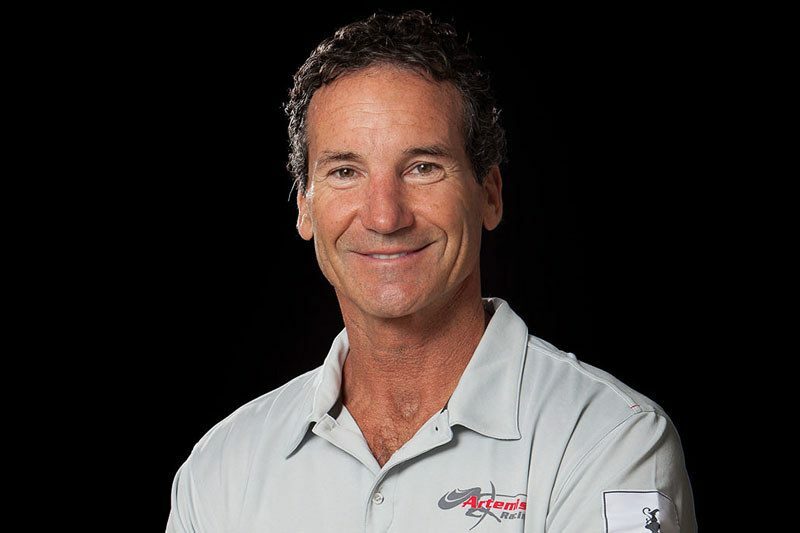 Along with other Bay Area racers and supporters, Harris-Adamson founded TISC in the 1990s. She has served as the chairperson of the board ever since. 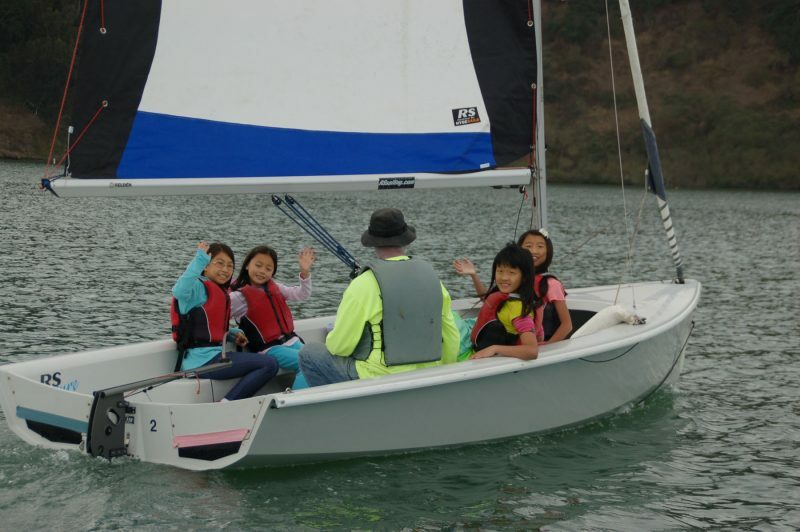 Since securing land space on the then-decommissioned military base adjacent to the protected waters of Clipper Cove, TISC has gone on to teach thousands of kids to sail. The center continues to expand programming while serving a huge percentage of kids on scholarship. For all her hard work, dedication and results, she was recently recognized at US Sailing’s National Sailing Programs Symposium in Jacksonville, FL, with the Virginia Long Sail Training Service & Support Award. 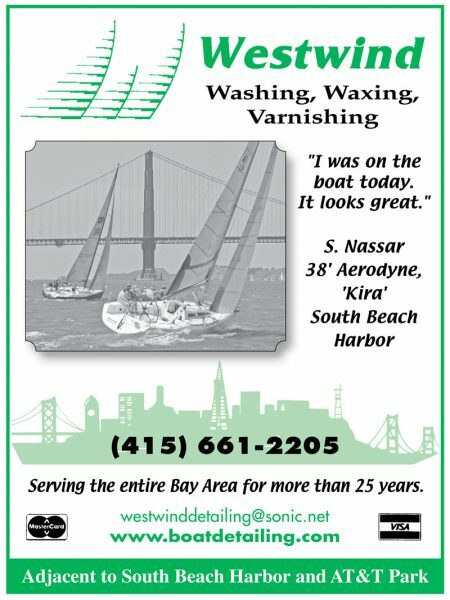 Carisa Harris-Adamson on location at Treasure Island Sailing Center. It’s hard to describe the vision and perseverance required to create the transformation of Treasure Island’s southeast corner. It’s gone from a barren parking lot to a thriving sailing center, classroom and now US Sailing Olympic training center. Early on Harris-Adamson saw the opportunity to create a world-class facility to help grow sailing, provide another avenue for elite training and competition, and, most importantly, use sailing as a tool to enrich the lives of San Francisco’s schoolchildren and help prepare them for adulthood and citizenship. She’s built a strong team of believers who have navigated the challenges of creating a world-class nonprofit in the heart of a major metropolitan area, learning to work with all the organizations and agencies required to secure facilities and funding. 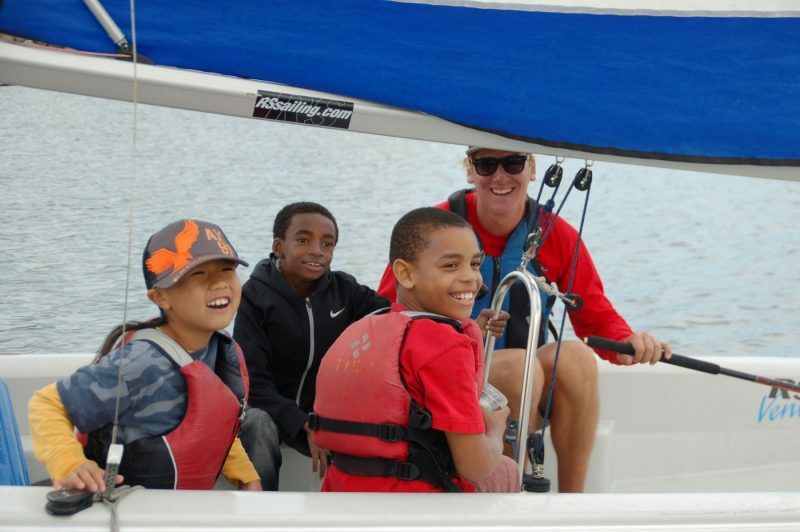 Provided scholarships to more than 80% of its youth sailing campers. Hosted numerous elite regattas, from the National High School Championships to the 2000 Olympic Trials. Started a girl’s empowerment program partnering with Life Learning Academy, a high school on Treasure Island, for underserved and at-risk girls. In two years, what started with 10 girls has blossomed to 230. Created a new initiative called “Puddles to Podium” that helps build the base of the pyramid for competitive excellence. 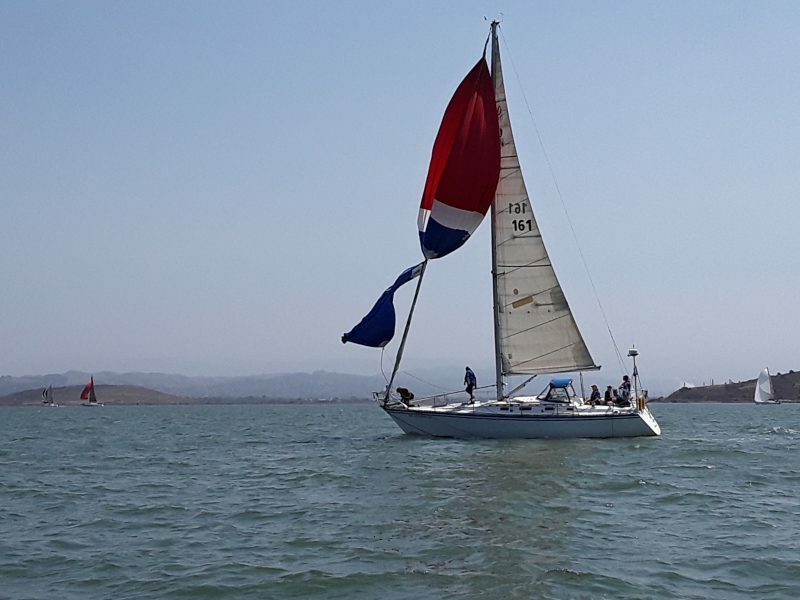 While it’s focused on competitive sailing, the initiative is designed to ensure that there are many “on-ramps” and fewer “off-ramps” for sailors in their care. Thousands of kids have had the chance to get off city streets and onto the Bay through the Treasure Island Sailing Center. A $965,000 five-year award to support their Summer Camp from DCYF (Department of Children, Youth and their Families – City of San Francisco). A $50,000 grant from the St. Francis Sailing Foundation, being used to supplement NOAA’s grant for Sailing to Save the Sea. In partnership with the St. Francis Sailing Foundation and FAST (Facility for Advanced Sailing and Technology), TISC is accepting the entire America’s Cup Base structure from Oracle Racing, starting the most exciting chapter in its Puddles to Podium initiative. If TISC were your classroom you’d be happy too. We’re looking forward to seeing the Oracle Racing America’s Cup base rising on the shore, seeing more elite sailors growing up here and others traveling in to take advantage of the new FAST training facilities, and numerous kids from the City and beyond who get smiles on their faces from their first taste of sailing. US Sailing’s Virginia Long Sail Training Service & Support Award certainly could not go to a more dedicated and deserving recipient.